Our emotions can affect our productivity, for good or bad. When you're in a “funk,” what can you do to address it and get back to getting things done? How do our emotions affect our productivity? How do we keep moving forward when emotions slow us down? I’ve received a number of questions from listeners regarding dealing with varying levels of sadness or moods when we need to be productive. Those questions, plus a friend asking on social media about getting out of a funk, inspired me to look into it and address the questions in an episode of the podcast. What are the different levels of sadness? Being in a general funk or feeling down in the dumps. This isn’t necessarily full-blown depression. We're talking about just being sort of down and feeling like we're not at the top of our game. It can last for a day, a week, or longer. One article in Psychology Today describes being in a funk as feeling “listless, purposeless, unable to motivate oneself, or caring about very little.” You may not be able to point to anything in particular that led to this funk; it's just a . . . mood. For more information, check out this article from High Existence. Discouragement about something in particular, such as a troubled relationship, stress from a job, or financial worries. Seasonal Affective Disorder or SAD. This is a form of depression that usually occurs during the winter months when there is less natural sunlight, according to the National Institute of Mental Health. It generally lifts during the spring and summer months. Temporary hormonal disruptions, caused by events or conditions like PMS, the “Baby Blues” (mild depression and anxiety that typically reduce two weeks after delivery), perimenopause, stress, or illness. For people who feel some of these feelings persistently (nearly every day for at least two weeks, according to the NIMH), experts recommend seeking help from a trained professional. Mental Health America also has an article about these symptoms, as well as a link to a depression screening. 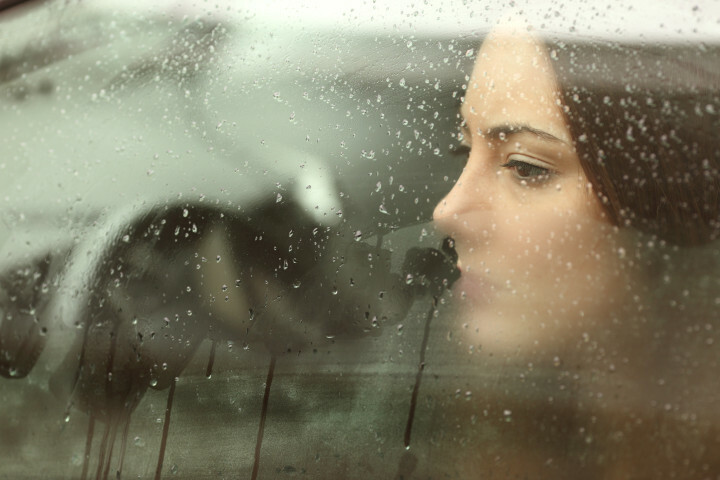 Pessimism or having low self-esteem can contribute to feelings of worry, sadness and anxiety — including feeling we have no control over life’s events. Some studies show those with a family history of depression have an increased risk for depressive illness. Stress from life events or changes may contribute to feelings of depression, including such crisis events as losing a loved one, financial problems, moving to a new place, losing a job, or starting a new job. Are you getting enough sleep? And is it quality sleep? Are you eating well and/or keeping your blood sugar levels stable? Are you getting enough Vitamin D? Note: Vitamin D is a fat-soluble vitamin and can be obtained by sun exposure, certain foods and supplements, according to the National Institutes of Health. Are you stressing your liver with too much alcohol and highly-processed foods? Are you dieting or getting an insufficient number of calories? We’re not always up and peppy — I’m not sure humans are meant to be that way. There are ebbs and flows throughout our lives. It can become a perpetual problem if we spend too much time focusing on the negative. Are you avoiding dealing with some situational or emotional issues? Is there something in your life contributing to these negative feelings and emotions? Ignoring these issues doesn’t make them go away. As women, our hormones may play a major role in our general feeling, overall. An article at PsychCentral.com says that more than 85% of women report some kind of symptoms in the week prior to getting their period. Vanessa Van Edwards of ScienceofPeople.com discusses the hormones that may contribute to that feeling of being in a funk and some tips to help increase the hormones we need in an interview. How Does Being in a Funk Affect Us? Employers lose an estimated $44 billion per year due to workers with clinical depression, according to one WebMD article. Workers can find themselves struggling with issues such as an inability to concentrate, the need to repeat a job or task, and working slower than usual. Studies indicate that even minor levels of depression are associated with a loss of productivity,. It’s difficult to be positive and supportive when you’re not feeling your best, and our mood affects those we’re close to. A poll mentioned in a blog post from The Couple Connection said 67% of respondents felt miserable when their partner experienced mood swings. Another study talked about on the Relationship Matters Podcast explored how emotions were linked between romantic partners. Men and women experience conversations about relationship matters differently. Men tend to fall in line with how their partner is feeling. That means when a man’s female partner is more positive, he becomes more positive; when she becomes more negative, he becomes more negative. Women, however, attempt to regulate the negative emotions of their male partners, so, for example, if her partner is negative, a woman may respond with positivity. When we’re in a negative frame of mind or experiencing negative emotions, it’s difficult to find motivation to do the things we want or need to do. We may lack energy and focus. We’ve talked in previous episodes about different ways to deal with negative moods and situations. Talk to someone. It’s easy to want to hide or stay home, avoiding social situations. Human connection, however, might be what we need to snap us out of it. So consider meeting a friend for coffee, or even just making a phone call. While social media may seem like a way to connect, it may not be the best solution. Explore the underlying issues that might be affecting your mood negatively. Write it down. Once article suggested starting by putting a name to what you're feeling: “I feel disappointed,” then expand that thought to “I feel disappointed about …” Take the time to identify and think through the “why” of how you’re feeling. Write yourself a letter. What would you say to your best friend if she was feeling the way you are feeling now? If you can’t find the words to describe how you’re feeling, try expressing your feelings through art or something creative: Draw, paint, sculpt, dance, sing–whatever helps you express what you're feeling. Clear your space. Cleaning of decluttering a space or a room can be a way to feel like you’re in control. It can boost your mood, and clearing the physical space around you may make room for thoughts to sort themselves out. For tips about decluttering, check out last week’s episode, The Art of Decluttering: An International Conversation (Episode 83). Take care of yourself. If the problem lies with something physiological, give yourself a break. Calm down with a cup of tea. Now is not the time to stress yourself out by worrying about others, when you should take the time to focus on your mood and needs. Give yourself permission to be in this funk for a specific amount of time. Create a playlist of songs for when you’re sad. According to Psychology Today, becoming aware of what we’re feeling helps prevent us from being swallowed by it. Do something fun. Find a way to laugh. Watch a favorite funny movie. Hang out with a happy young child. Get some exercise. Movement and exercising boost the “feel good” chemicals in your system, and can burn off the stress that might be contributing to the sad or down feelings. What thoughts am I thinking that’s causing me to think this way? What do I want to feel? What are the thoughts would make me feel that way? What can I focus on to make me feel the way I want to feel? Practice thinking those thoughts, not ignoring reality. You can journal these thoughts and answers, as well. List what you’re grateful for. Write or say these out loud to yourself. Think of someone you can thank. If there are people who have made a difference in our lives, remember to acknowledge what they’ve done for you. Get outside your own head for awhile. Shift the focus off you and do something for someone else. Look at photos from happy events of your life. Journal about proud moments, which boosts serotonin — a “feel-good” chemical. Create a bucket list of things you want to do. Doing so may make you excited and give you hope for accomplishing something you look forward to — this will boost dopamine. Taking action on a particular goal is even better. See your doctor. There may be physiological explanations for how you’re feeling that a trained professional may be able to help you with. Take a serious look at your life. Is someone or something in your life feeding a tendency you already have toward negativity? Is someone abusing you, emotionally or physically? What outside factors contribute to your feelings of negativity? Consider therapy. This is especially encouraged if this feeling of “funk” is a recurring or ongoing/long-term situation. If you feel like you’re in a crisis, whether or not you’re having thoughts of hurting yourself, you can get confidential help immediately: Call the 24-hour, toll-free confidential National Suicide Prevention Lifeline at 1-800-273-TALK (8255) or go to Suicide Prevention Lifeline. Do you have suggestions for ways to deal with those times when you’re down? I’ve love to hear your comments on this episode. Please feel free to ask your questions or share your thoughts with me by emailing me, commenting on our Facebook page or leaving a comment below. I’m available to speak at your events — women’s retreats and conferences, productivity workshops, business teams, etc. Send me an email or call me at 972.638.0308 to chat about how I can add value to your event. My biblical counseling instructor would say ‘get up and put one foot in front of the other’ until the depression lifts. It usually does with situational causes. Another comprehensive and balanced presentation of a very real problem to overcome. Thank you Laura! I’m going to use the write yourself a letter technique to nail the source of my funk. As always so helpful and timely! Thank you, Kelly. I’m glad to know it helped. I’m feeling like being in a funk. In such moments I’m looking very carefully through my portfolio of podcasts and blogs. Sorting out all citius, altius, fortius episodes, looking for more substance. Sometimes there is this kind of coincidence. This TPW084 episode of yours is giving me a lift. Especially the two ways: Morning Post and Letter to Myself touched a nerve in me. I have already started. And what should I say: it’s feeling even more worse. But at the same moment I see and feel the way out of it. That’s more than I hoped getting up 3 hours ago. Thank you for this episode Laura. Georg – We all do have those times, don’t we? Interesting that in trying to address it–through writing about it–you find yourself feeling worse. I’ve felt that too, sometimes. I think maybe it’s because instead of trying to ignore the feeling, or suppress it, we are looking directly at it, acknowledging it, really *feeling* it, so that makes it seem stronger and more real for awhile. But that’s how we can really get to the root of what’s causing us to feel bad, and ultimately deal with those things and get through to the other side. I hope that’s what you mean by being able to “see and feel the way out of it.” And I hope you’re feeling better soon. Thank you so much for taking the time to write. I’m grateful to know you listen to the podcast, and so glad you found something helpful in this episode. Thank you Laura for your kind words. yes, I will (of course) see a way out of the trouble. Every hill needs its valley. Sure. Standing in the valley lets even the smallest hill look big. As even the longest trail starts with a first step I am grateful for your hints for this step. On the subject of being positive and seeing the “bright side” of everything, I remember watching a comedian on Netflix (whose name escapes me) who said, “Find the funny”. I now use that as one of my mantras. So no matter how bad things get, always FIND THE FUNNY. That’s a great twist on the idea of looking for something positive. I like it. Thanks for sharing!